Nokia's business strategy is a confusing one. It seems as though every time we get our hands on a brand new handset, a new one is announced a couple of months down the line. 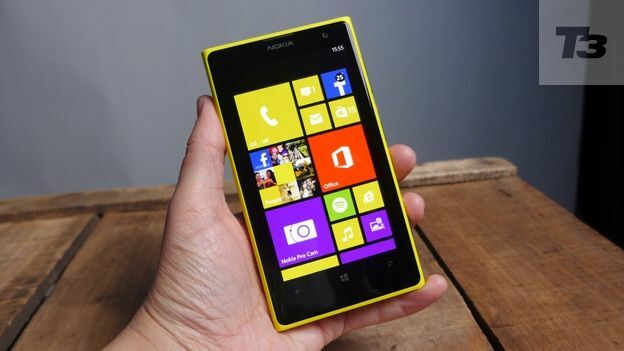 In the couple of weeks we've had with the Nokia Lumia 1020, a Nokia Lumia 1520 has already been announced for October. Nokia's hardware and services divisions are now, of course, part and parcel of the Microsoft juggernaut, effectively consigning Nokia to a future with Windows Phone. There was already a solid agreement in place that meant this was already the case, but the latest deal puts to bed the lingering hopes that we'd see Nokia make an Android handset. Going head to head with the likes of the Samsung Galaxy S4, HTC One and Sony Xperia Z, the 1020 may be one of the last out-and-out Nokia phones we ever see. Is it a worthy send-off for Finland's mobile hall-of-famers? As with the Lumia series in general, the build quality is extremely solid and would certainly survive a few knocks. Nokia is still determined that people want bright yellow phones - despite a decade of police-sponsored advertising telling us to keep our phones hidden to prevent petty crime - but as is always the case with colours, you'll either like it or you won't. Normally you could put a case on it if you didn't like the colour. But the Lumia 1020 is a chunky old thing - measuring 130.4 x 71.4 x 10.4mm - and wrapping a case around it would just be overkill. The camera that sticks out at the back only emphasises the Lumia's massive bulk. And it weighs in at 158g - significantly heavier than its leaner, more athletic competition. It's also a bit trickier to hold than its older brethren. Not only is it large and cumbersome in the hand, but the matte surface is a bit slipperier than the older models. Under the hood there's a Dual-core 1.5GHz Qualcomm Snapdragon S4, backed up by 2GB RAM. It's enough to get by, but like the design, it isn't exactly cutting edge. We can't help but feel that compared to the Sony Xperia Z1, iPhone 5s and LG G2, the Lumia 1020 is a little underpowered. Unlike all those phones, the Lumia 1020 is running Windows Phone 8 Amber, the latest version for Nokia devices. Amber has a couple of tricks up its sleeve - flipping the phone face down will put it on silent, while a quick double tap of the screen will wake it from standby. Aside from that, you're looking at plain old Windows Phone 8, which means you're already dealing with a woefully under-stocked app store, not to mention the lack of a proper notification system. Live tiles are a really nice touch both aesthetically and for their utility, but you often have to scroll through them all to see what's going on. And if you don't have a live tile on your dashboard, there's nothing else to tell you if you've missed something. The usual array of NFC, Bluetooth and microUSB connectivity is included, along with up to 32GB of on-board storage (or 64GB if you buy from O2) and 7GB of free cloud storage thrown in too. Don't forget about Nokia's wireless charging tech too, which is still pretty cool, even if it does require additional accessories. Clearly, the camera on the Lumia 1020 is the main selling point here. We're dealing with a 41MP PureView sensor similar to that in the eternally damned Nokia 808 PureView, and a Carl Zeiss Tessar lens. And thanks to the optical image stabilisation, the camera on the Lumia 1020 takes superb single shots. The problem is, once you've taken a great, high-resolution photograph, how do you transfer it? The files are way too big to send over data plans, so unless you have Wi-Fi you won't be transferring anything without a USB cable. In terms of apps, the Lumia 1020 is well equipped, although the names are a little confusing. Nokia Pro Camera takes single shots and HD video and gives you the option to adjust exposure, shutter speed, ISO, white balance and focus. Nokia Smart Camera takes burst shots to get the best shot or create a strobe shot. Not all your shots will be 41MP, in fact your standard shots will still be 5MP to allow for sharing to social networks, anything bigger will eat away at your data if you want to send it anywhere, and will need some editing. Fortunately, Nokia has just the thing. A variety of editing apps for photo and video give you loads of options for cropping, balancing and editing your pictures. Another benefit of the enormous sensor is that you get a degree of lossless zoom, which means that you can zoom in up to 3x to take a shot, and be safe in the knowledge that you aren't sacrificing any picture quality. If we do have one major issue with the camera, it's the shutter lag. Often there's a delay of almost a second between hitting the shutter, and seeing the Lumia take your picture. This does rather render some of the clever tech on display null and void, as you may well have missed your best shot before the shutter gets going. The 4.5-inch display is very nice indeed. The super sensitive touch-screen technology is just that, making the Lumia 1020 responsive and accurate with your taps and swipes. Resolution wise, the panel is a 1280 x 768 AMOLED display with a pixel density of 334 pixels per inch, marginally better than the Retina display on the new iPhone 5c and 5s, but far below the monster pixel density of the HTC One or Samsung's latest Super AMOLED displays. Still, it's nice and bright, the viewing angles are good and the display is crisp enough to do justice to all those photos you've been taking. The on-board 2000 mAh battery is sufficient but again, that's only because the other internals are significantly underpowered in comparison to its high-end competition. Compare it to the Sony Xperia Z1 for example, which has a 3000mAh battery. The battery is fine for a day if you're dealing with basic tasks, but as soon as you start taking and editing photos, it disappears very quickly. Fortunately, you can buy a separate camera grip case, complete with extra battery inside. Get used to it - you'll be needing that battery. But the grip is a nice touch too, comfortable in the hand and nice to use. It's a little sad that the sun has set on Nokia in this fashion. In the entire Lumia series, we've seen the same hallmarks; good build quality, some clever ideas, superb cameras. But there are little issues everywhere that stop the Lumia 1020 being true competition to the top-end Android phones and the iPhone 5s. It's too bulky. It's underpowered. And worst of all, it's running an inferior operating system. If we look at the camera, what Nokia has tried to do is admirable, but it falls short. Yes, it's the best camera in any phone on the market in terms of image quality and performs outstandingly well. But you still have to account for the shutter lag and the impractical file sizes. And ultimately, as good as it is, it doesn't come close to outperforming even an entry-level DSLR. It's just a little impractical.